New, bigger&better scans of the same comic (except text & non-house ads) uploaded over 5½ years ago. Also now with HAG fc+bc. Synopsis: In an effort to photograph an annual gorilla mating ritual, Prof. Lynne and his daughter visit Kaänga's jungle. Their safari guide, Cass, schemes to create faked footage and to murder the Lynnes. Kaänga foils the scheme and a real gorilla kills Cass. Comic Story (6 pages) "One must be ever wise and ever cunning to survive in the jungle..."
Synopsis: While Simba is attempting to teach Simba Jr the laws of the jungle, they are captured by trappers. Simba Jr is released as too small to sell. 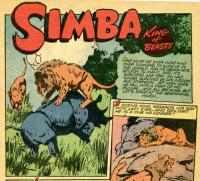 He sneaks back to the cages holding Simba and other jungle animals and releases them. Synopsis: A brief natural history of the gorilla. Synopsis: Terry is taken captive by his old foe Ali Bey, who is also attempting to secure the Baänji, a priceless elephant idol. 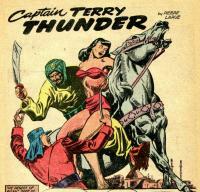 Keeto schemes to rescue Terry through a double cross on a Trojan horse ploy. Comic Story (6 pages) "Ever hatred festers in the steaming brush!" Synopsis: A jungle priestess murders her chief and frames Wambi for the crime. 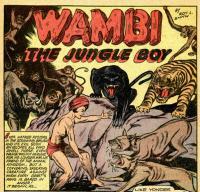 Word spreads even to the jungle animals of Wambi's alleged crime. 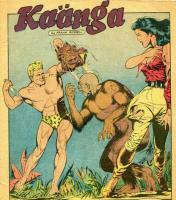 Wambi is captured by the tribe and is put trial by dunking. 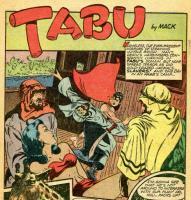 Faithful Tawn rescues him, the priestess confesses, and the tribe executes her by drowning. Synopsis: A brief natural history of the Cape buffalo, also known as the black buffalo. Synopsis: Tabu attacks a band of slavers and releases their captives. 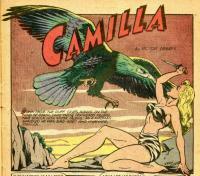 Synopsis: Camilla goes to the rescues of the Wasais, who have been taken by the bird tribe.